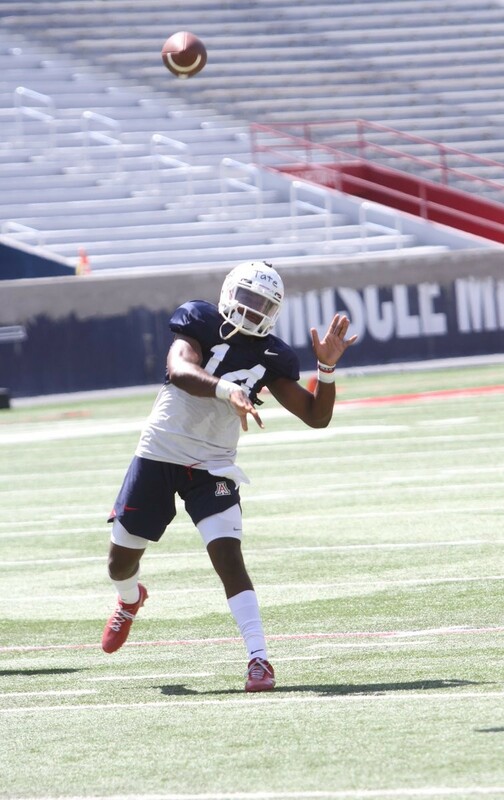 Arizona junior Khalil Tate leads the Wildcats through practice on Tuesday, Aug. 7. Jeremy Springer took a deep breath and let loose a torrent of football jargon after practice on Tuesday afternoon. Springer, 29, is in his first season with the Wildcats, coaching the special teams unit for Arizona this fall. The native Texan, whose brother, Justin, works as a strength and conditioning coach with the Wildcats, is tasked with building a core unit of kick and punt coverage and return team players. His task isn’t simple, but is a labor of love, with Springer enjoying the early work he’s put in with the units. He’s thrilled with the two-man kicking competition between rising senior Josh Pollack, who converted 11-of-15 field goals a year ago (and 23/29 in his two-year tenure) and rising sophomore Lucas Havrisik. Springer was rather tight-lipped about the status of the competition, saying both have what it takes to excel this fall. It’ll be hard to deny Havrisik, who showed off his rocket-powered right leg in spurts as a freshman—hitting 3/4 field goals, including a 57-yard bomb. Springer wants one man to handle the team’s kicking needs this fall, unlike last year, when the two split reps depending on the distance needed. He is impressed by the effort that each player has shown in spring and fall camp, with Havrisik exhibiting strong potential, while Pollack has honed his workman-like attitude toward the craft. Havrisik believes he’s done everything he can to win the job ahead of the team’s opener against Brigham Young in Tucson on Sept. 1. The Riverside, California native says he’s been working hard on the field and in the weight room over the offseason—getting his weight up from 163 to 188 pounds since the end of the season. He’s also worked on his form, trying to eliminate any stutter-steps that derail kicking form in games. His offseason routine has also included extra yoga and stretching work with Justin Springer, which has paid dividends already, according to the sophomore. He believes that his steadfast approach to kicking will earn him a leg up on Pollack in their friendly competition for the starting job. Havrisik said the two-man battle for the starting kicker role has remained friendly, with each kicker doing their best to learn what they can from each other. He believes their camaraderie will help come the regular season, as they’ll be able to talk with each other when things are going well and commiserate when they’re not. Havrisik believes that the addition of Springer as a full-time special teams coach can help the unit tap into its fullest potential this season.